I was asked to post the pattern for the dragon in the Norse-inspired Draco Invictus weave I made a few years ago. Draco Invictus (dragon unconquered/invincible) is the motto/war-cry of the Middle Kingdom, and I wove it in Viking runes along with two dragons. I made the pattern for the dragons myself, after being inspired by searching for "Viking dragon" images online. It's not easy to weave as the picked up and dropped threads don't match the baltic/basketweave base very well and some of the floats are quite long. If I'm not mistaken, I ended up hand-sewing down some of the larger floats after it was finished. This is one of the first pick-up weaves I made, which is why it's not as easy to weave as the patterns I make now. Regardless, here it is! The light red is the base baltic/basketweave pattern, so whenever you see those threads, they need to be dropped. The dark red is the visible threads, so they need to be picked up where there would usually just be a white space. 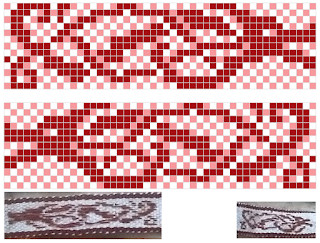 The weft thread needs to match the background thread (in this case, white). For more details and tips on how to warp and weave baltic/basketweave pick-up patterns, see my initial post on how to do that. 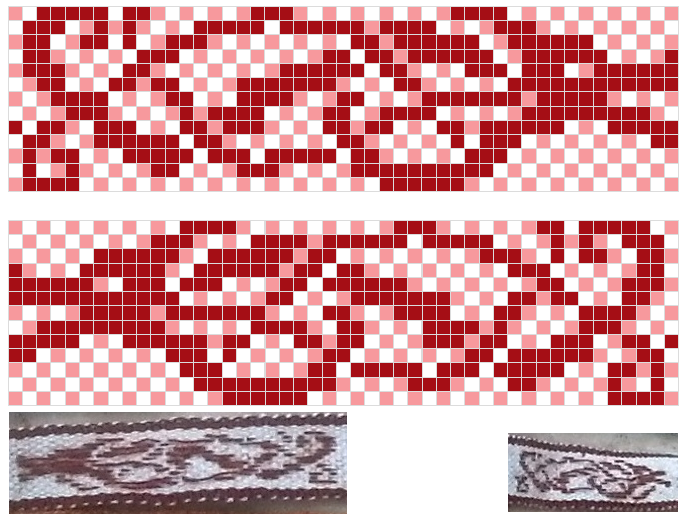 Feel free to use this pattern in your own inkle weaves, and alter it so that it's even better. I'd appreciate it if you would link back to me, and please share your creations with me! I'd love to see what this inspires!